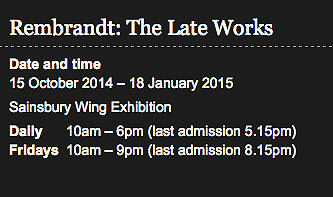 With ‘Rembrandt: The Late Works’, Dr Betsy Wieseman has put together a once-in-a-lifetime exhibition which examines the themes that preoccupied Rembrandt as he grew older: self-scrutiny, experimentation, light, observation of everyday life and even other artists’ works; as well as expressions of intimacy, contemplation, conflict and reconciliation. From the 1650s until his death in 1669 Rembrandt, the greatest master of the Dutch 17th century, pursued an artistic style that was expressive and radical. His bold manipulation of printing and painting techniques and progressive interpretations of traditional subjects inspired generations of artists.